We would like to liven up our Facebook Page which has been very silent recently so we dediced to organize a contest who is open for applicants from every age. What sould I do to join? You need to take a photo of your work and add it to our Facebook Page That is all. 1-Each applicant can join only with one work. 2-Not any other techniques rather than folding are allowed such as gluing. 3-Not to write insulting, heart breaking or overdose criticism under the pictures. 4-Applicants must join with their own work which is folded by themselves. The finalist will not be able to receieve his/her prize unless she/he send her work to us. When is the contest beginning? It has already started. You can upload your image right away if you already have one. Last date you can join is 19th July 2009 Sunday. How will the assessment be done? The assessments will be done by the contestants by giving numbers from 1 to 10 to each work however they will not be allowed to vote for their own work. After the applications ended and we will send email to the participants asking them to vote. 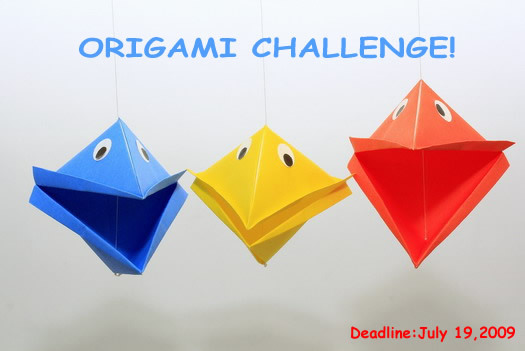 The winner will be announced here in Origamisan on 27th July 2009 Monday. Winner will have this Mini Origami Set.